The report presents a number of conclusions and recommendations related to mainstreaming IDPs and their justice claims into the work of transitional justice. In particular, transitional justice processes should allow for and ensure the full participation of IDPs, and they should complement humanitarian, development, and peacebuilding interventions that address internal displacement. Transitional justice measures, such as reparations and criminal justice, can also play a central role in reintegrating IDPs into post-conflict societies, which is critical to a durable peace and the prevention of recurrence of conflict. IDPs lack the international protection regime in place for refugees. And while forced displacement can be a result of conflict, natural disasters, or even large-scale development projects, such as mining or the building of dams, IDPs are often victims of their own governments, which are ultimately responsible for their protection. As a result, human rights groups and the international community have a limited number of tools at their disposal for assisting IDPs and for compelling governments to uphold their human rights obligations to IDPs inside their borders. 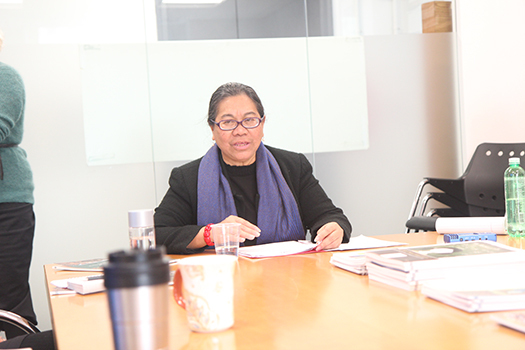 According to Ms. Jimenez-Damary, it is also essential that transitional justice processes support the vision and political aspirations of the victims themselves, not just experts in the field. “I’m very keen on ensuring the participation of IDPs in all decisions affecting them,” she said. Many of the insights the Special Rapporteur shared during her visit, as well as the findings and recommendations in her recent report, reflect the work of ICTJ on IDPs and refugees, both past and present. From 2010 to 2012, ICTJ collaborated with Brookings Institution and the London School of Economics on a project on the ability of transitional justice mechanisms to address displacement and the justice needs of IDPs and refugees. The partnership culminated in a report, published in June 2012, which underscored the importance of truth-telling, reparative justice, and giving voice to and including victims of displacement in transitional justice processes. In several countries where ICTJ has an active presence, such as Colombia and Kenya, experts and other staff work closely with IDPs to facilitate their meaningful participation in transitional justice processes and ensure that official policies include their views and needs. Similarly, ICTJ works with refugees in a number of regional contexts. Most recently, for instance, ICTJ conducted studies and published reports in 2017 and 2018, respectively, on the experiences of Syrian refugees in Lebanon and on refugees from the Central African Republic in Cameroon and Chad. Both studies involved extensive qualitative research, based on interviews with refugees. The former report found that, for Syrian refugees, the restoration of their dignity, is key to creating the necessary conditions for return, peaceful coexistence, and the building of a stable post-war Syria. In that latter report, Central African refugees stressed the importance of inclusion—specifically, strong messages from the highest levels of government that affirm they are Central African citizens with equal rights—as a condition for return and for durable peace and justice. ICTJ continues its work to achieve meaningful inclusion and reparation for IDPs and refugees.